Charismatic host Willie Revillame surprised his 'Wowowillie' studio audience on Tuesday, February 19, by donating his personal coaster van to Sister Theresa and her companions. He also handed the nun P50,000 from the show’s fund to help those who want to join the vocation. It’s not a rare occasion that main host Willie Revillame gives out cash prizes to lucky studio members on TV5 noontime show Wowowillie. In fact, he promised that those coming from far-flung provinces—some would even borrow money just to try their luck in the noontime show—can reimburse their transportation expenses when they watch the show at its newly-refurbished, 1,100-capacity studio along Quezon Avenue. Last Tuesday (February 19), to everyone’s surprise, the generous host veered from the usual shouldering of transport expenses and instead gave away his personal van to one of the studio members. 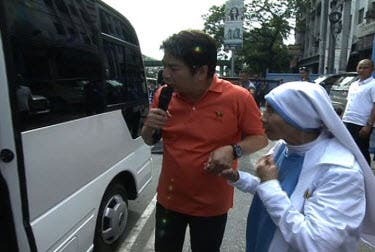 Dressed like the revered Mother Teresa of Calcutta, Sister Theresa of the Cenacle of Virgin Mary (a community of nuns from Our Lady of Fatima under the Diocese of Pasig) was overwhelmed when Kuya Wil pledged to give her his 25-seater coaster. This after the nun told Kuya Wil that their growing community lacks a means of transport whenever they do outreach programs. “Ang kailangan po ng aming community, dahil napakarami po namin, wala po kaming sasakyan,” Sister Theresa said. Live on national TV, Kuya Wil turned over the van to Sister Theresa and her companions. Furthermore, the charismatic host handed the nun P50,000 from the show’s fund to help those who want to join the vocation. Aside from giving away cash and prizes, Wowowillie also brings together Filipinos in the genuine spirit of goodwill. Kuya Wil also continues to touch people’s lives by giving them renewed hope that gets them through their everyday struggles. Wowowillie airs on TV5 from Monday to Saturday at 11:30AM.